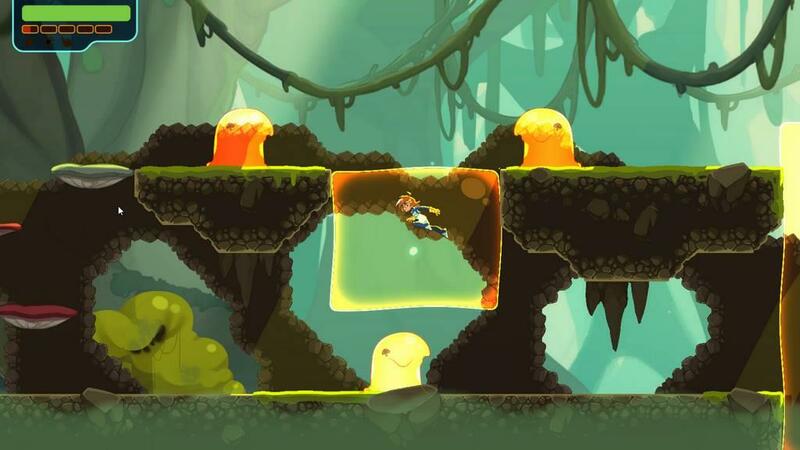 When people think of platformers, the first thing that comes to mind is a game where you have to run from left to right to complete a stage while taking out enemies. It’s a tried and true formula that’s worked for a long time. Other games and franchises have improved on that concept with more advanced platforming, RPG-style elements, and so on. 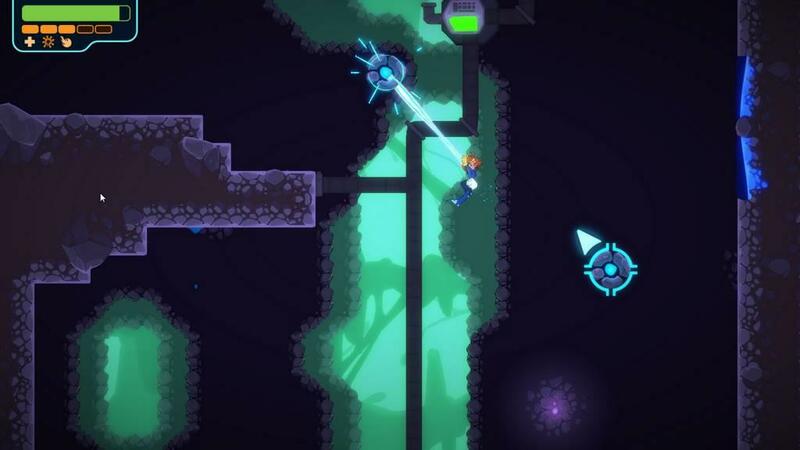 However, Double Cross is unique in that you not only have to navigate each area, but you’re also performing an investigation and upgrading your abilities as well. In a way it’s kind of a mix of a couple of genres on top of traditional platforming, but does it work well enough to be enjoyable? Let’s take a look at a preview build of Double Cross on Steam and find out. You play as Zahra, an agent of RIFT (Regulators of Interdimensional Frontiers and Technology), and her job is to maintain peace and order between all dimensions. 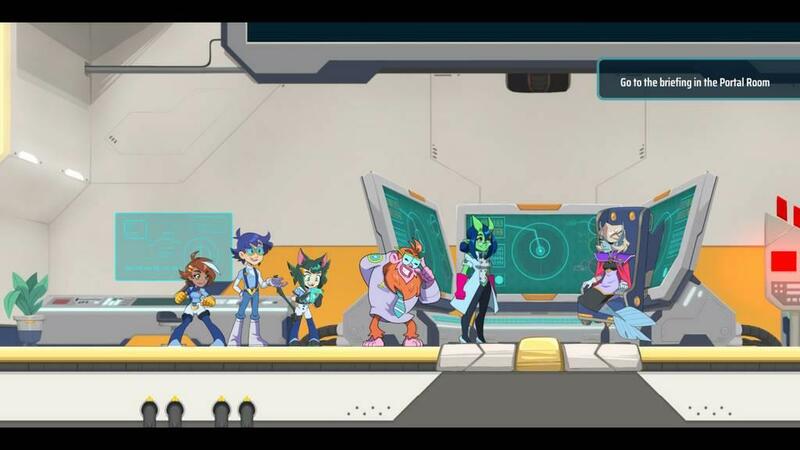 However, after Zahra partakes in a training session and sees about any possible cases to take on, someone infiltrates RIFT headquarters and it’s speculated that it was an inside job as it’s nearly impossible for anyone to infiltrate RIFT HQ. 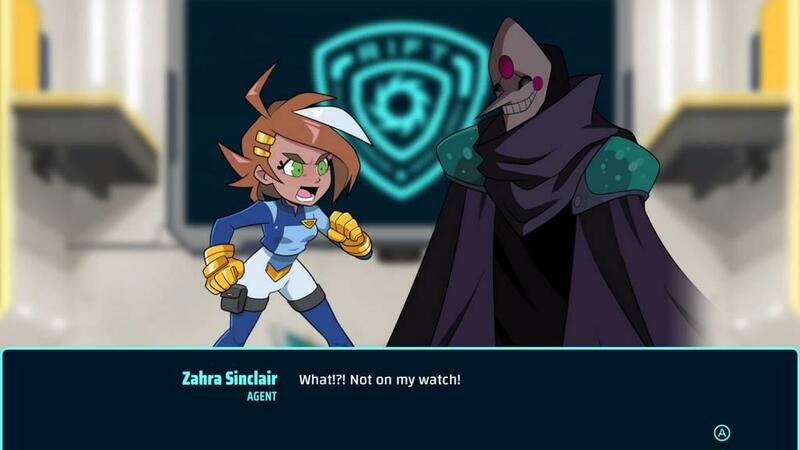 Zahra soon runs into the person responsible, a cloaked and masked man whom she names Suspect X. Zahra must now track down Suspect X and not only figure out who they are but why they invaded RIFT HQ. Once the intro to the story and plot are out of the away (and there’s quite a bit of it to go through), you’re finally able to take control of Zahra and test her abilities in the training room. Here you’ll learn how to attack enemies and use her Proton Slinger to get around areas, and it’s the Proton Slinger that’s kind of the star of Zahra’s abilities and probably the reason why the game recommends using an Xbox-style controller. Throughout the game you’ll see a bunch of orb-like objects that Zahra can use the Proton Slinger to latch onto. When using it, time will slow down allowing you to aim with the right analog stick with an arrow appearing to show what direction you’ll sling in when you release the Slinger button. Upon release, you’ll sling yourself towards the direction you aimed and the further you were from the sling point, the farther you’ll fly. This means getting used to the Proton Slinger’s mechanics are a must to proceed very far into the game. You can also grab certain projectiles out of the air with the Slinger and throw them back at enemies. When a projectile comes within the Slinger’s range, simply use the Slinger and aim it at the projectile. You’ll lock onto it and as soon as you release the button, you’ll pull the projectile in and grab it. Then just activate the Slinger again to aim and throw the projectile back where it came from. This is also used to grab certain stationary objects and fling them to wherever you want or need. This could include orbs to activate certain switches or different types of goo to help you climb walls or bounce high off of the ground. Again, mastering the Proton Slinger is a must. While Zahra plays Bionic Commando, she’s not completely defenseless. Her basic attacks are light and heavy punches and later in the game she gains access to more attacks. 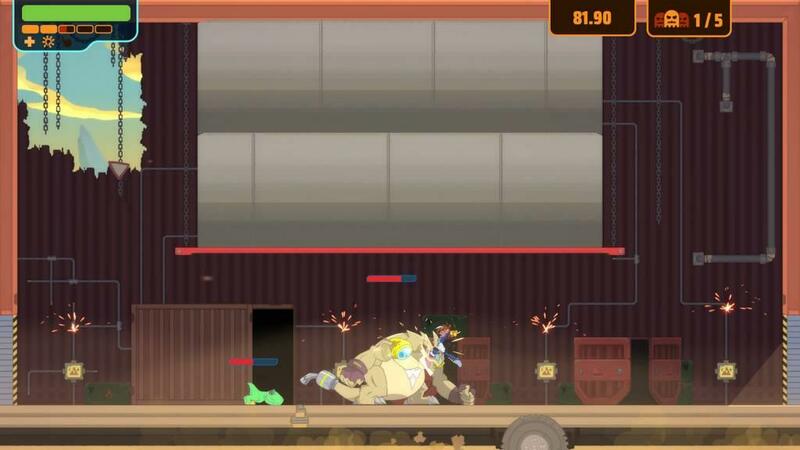 You can also do a dodge maneuver while moving which also makes you invincible for a few moments. This is something else you have to get the timing down for as you’ll need it in a couple of areas to dodge some lasers that you’re otherwise unable to get past. You’ll also notice little yellow balls that enemies drop when defeated. These will power up a meter below Zahra’s life bar that has five segments. Zahra has different abilities she can perform depending on how many segments are filled up. At the cost of one segment Zahra can recover part of her life bar, for two segments she can do an area of effect blast that will damage anything near her, and for three segments she’ll fire off a powerful fireball that can do a great deal of damage to any enemy it hits. The early enemies actually aren’t too difficult to deal with so if you have all five segments filled up, feel free to use a couple to top off your health. An interesting aspect of the game that I alluded to is that you’re also investigating just who Suspect X is and why he infiltrated RIFT to begin with. This is done using an investigation system of sorts. At the start you have three cases you can tackle in any order and each takes place in a different dimension and each dimension has its own mechanics to master. Each dimension has three stages that you can also complete in any order with a fourth stage that you have to unlock. This is done by gathering evidence for the case you’re working on and presenting it to the correct person to move the case along. This actually isn’t as difficult or puzzling as it sounds. You tend to get the evidence as you go in each stage and finding the right person is just a matter of going up to someone at RIFT HQ and showing them said item. If it’s the correct item you’ll trigger a cut scene. Otherwise they’ll just say something about the item or offer a suggestion as to who to show it to, but that’s it. It’s an interesting concept in terms of moving the plot along, but the game could have also had Zahra say “hey, so-and-so might have some knowledge of this item” and it would accomplish the same task; there’s no penalty or consequence for talking to the wrong person. You can upgrade some of Zahra’s abilities and attacks by collecting something called Upgradium. In each stage you might come across a purple crystal known as Upgradium. Each stage has several and at the end of the stage the game will tally up what you found. Every several found will result in leveling up and each level up will usually unlock some sort of ability for Zahra. These can be permanent upgrades such as more health or new attacks, or ones you have to select to use such as increased time to aim your Proton Slinger, a shield that can absorb an attack, or shortening the time it takes to recover your health as mentioned earlier. The latter upgrades have a slight catch though: you can only use three at any one time. Each stage will have checkpoint consoles and you can change your upgrades at these consoles. As with most platformers I’ve enjoyed my time with Double Cross, but I did encounter a couple of glitches now and then. One of them involved moving past raising platforms which you can jump on, and somehow as it rose up I got stuck in a wall next to it. Thankfully I could jump out of it once the platform lowered again. The other glitch was a bit bigger, but thankfully not costly. I had to activate a switch up on a platform that would start a fuse followed by a timer ticking down until a huge explosion occurred. As I jumped down from the platform I somehow fell straight through the floor and died, and this wasn’t a floor you could drop through by holding Down and hitting the jump button. Thankfully as I’ll explain in a moment it didn’t impede my progress, but was still confusing when it happened. Then there’s one final thing that, unless I’m missing something, is just a bit of poor programming: there’s no way to fully exit the game. There is a Save and Quit option on the pause menu, but once you go back to the title screen, there’s no option to quit the game and return to the Desktop. Naturally the Switch version won’t need this but Steam kind of does. To exit the game I had to hit Alt+F4. Not a major issue, just a confusing one. Beyond that though I really only have a couple of complaints. I already mentioned the investigation mechanic and how it’s kind of like puzzle solving without any consequences for doing something wrong outside of wasting time. Then there’s also the fact that a lot of the game is actually kind of easy. The game has multiple “fun” levels, but the names are kind of bizarre such as Very Fun, AAAAAAA, and Fairy-Type. Honestly, I’m not sure if these are supposed to be difficulty levels or just other ways to play because while you can change the Fun level on the fly while playing by pausing the game and going to the Options menu, I couldn’t tell any difference between them so I just left it on the default Very Fun setting. In terms of overall difficulty, a lot of the game is actually pretty easy. While there are checkpoints, if you fall down a pit or touch spikes, you’ll be sent back to the last piece of solid ground you were standing on and lose a little bit of health. Losing all of your health means you just go back to the last checkpoint you hit. Given how little health you lose when you drop into a pit or hit some spikes, you’re given a lot of chances to get used to the Proton Slinger. Overall, the preview build of Double Cross was a lot of fun and I’m looking forward to the final build. While the difficulty does skew on the easier side for a lot of it, that didn’t mean I didn’t have fun with it. The Proton Slinger is fun to play around with, the investigation mechanic, while not really adding a whole lot to the game in general, does add to the plot, and the fact that each dimension has it’s own mechanics to learn and master means each one plays differently and you’re not just doing the same thing over and over. The music is pretty good and the graphics, while different from other similar games in the genre, or in general, are actually pretty nice and kind of reminiscent of a Saturday morning cartoon. 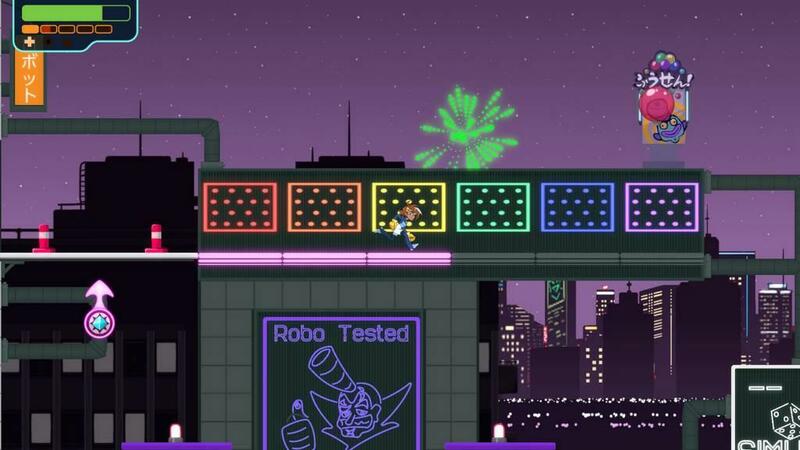 If you enjoy a good platformer mixed with some investigation and a little Bionic Commando, Keep an eye out for Double Cross when it launches early next year.